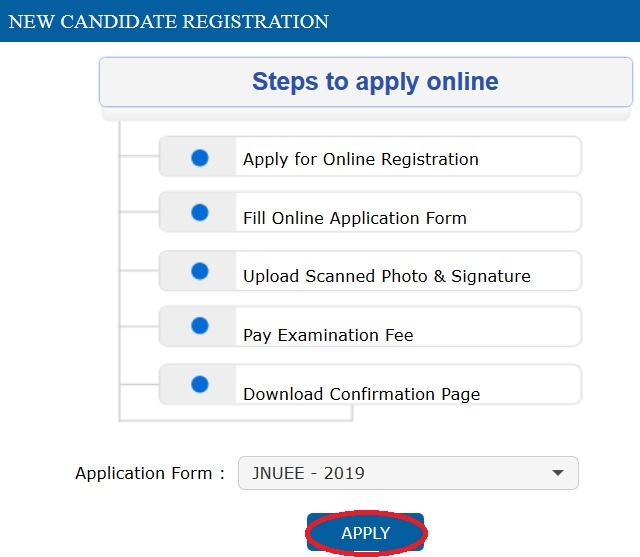 Jawaharlal Nehru University invites applications for JNUEE & CEEB Jawaharlal Nehru University Entrance Examination & Combined Entrance Examination for Biotechnology for the year 2019. ** The eligibility Criteria and Subject wise Qualifications for admission are given in Annexure-XV. ** The Minimum Age limit for B.A. (Hons.) Programme is 17 years as on 1 October 2019. There is no age bar for any other programme. Registration for Online Application Form and note down system generated Application Number. ** Scanned photograph and signature should be in JPG/JPEG format. ** Size of scanned photograph should be between 10 kb to 200 kb. ** Size of scanned signature should be between 4 kb to 30 kb. ** The photograph should be coloured or black/white (but clear contrast). Note : Upload the correct Photograph and Signature as the facility for correction in images will not be given. The candidate has to select Debit/Credit Card/Net Banking option to pay the application fee and follow the online instruction to complete the payment of fee. After successful payment, candidate will be able to print the Confirmation Page. In case the Confirmation Page is not generated after payment of fee then the transaction is cancelled and amount will be refunded to the candidate’s account. However the candidate has to make another transaction, in case the Confirmation Page is not generated. (i) Whether they fulfill the eligibility conditions for the Test as prescribed under the heading ‘Conditions of Eligibility’ and ‘Age Limit’. (ii) That they have filled their category viz General/OBC (Non-Creamy Layer)/SC/ST/EWS/PwD/ Transgender, in the relevant column correctly. The candidate has to download the Admit Card from the NTA website w.e.f. 10 May, 2019 onwards and appear for the Examination at the given Centre on Date and Shift (Timing) as indicated in their Admit Card. 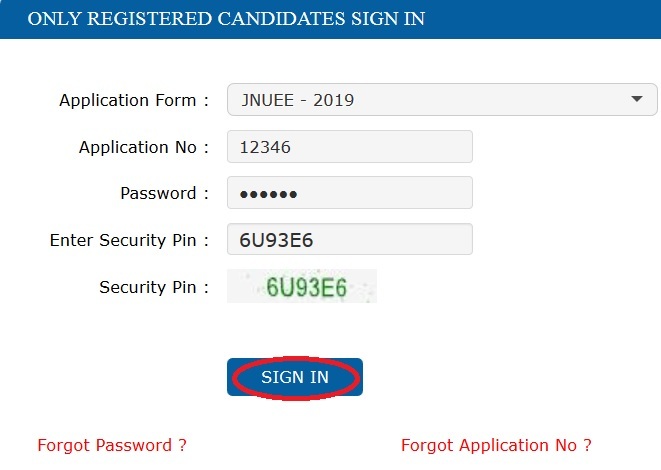 In case candidates are unable to download Admit Cards from the website, the candidate should approach the Help Line between 10:00 am to 5:00 pm from 01 May, 2019 to 17 May, 2019. (i) The candidates, before submitting the Online Application Form, shall ensure their eligibility to appear in the test. (ii) The Candidates should fill their complete postal address with PIN Code for further correspondence. (v) Online submission of application may be done by accessing the NTA official website www.ntajnu.nic.in. (viii) A candidate is allowed to submit only one Application Form. If a candidate submits more than one Application Form, the candidature is likely to be cancelled. Note : However, a chance may be given to the candidates to correct/modify/edit some of the particular(s) of the application form online only, during 22 April, 2019 to 28 April, 2019. (x) The Centres (Cities) indicated for the entrance examination by a candidate is only an option. The actual Centre and shift shall be allotted by NTA and it shall be final.